An empowering book with photos, notes, and true stories about an underground campaign to recognize the true beauty within every woman. Tired of watching women pick themselves apart in front of the mirror, blogger Caitlin Boyle scribbled a note on a Post-it: "YOU ARE BEAUTIFUL!" and slapped it on the mirror of a public bathroom. With one small act, she kick-started a movement. In a matter of days, women were undertaking their own feats of resistance, posting uplifting notes on gym lockers, diet shakes in supermarkets, weight-loss guides in bookstores, and anywhere else a nagging voice of self-criticism might lurk. Emboldening and contagious, the "operation" has attracted widespread attention from the media, including the New York Daily News and salon.com. Operation Beautiful showcases the notes women have posted around the world and the stories behind them, along with interviews, interesting research findings, and tips for improving one's outlook on life. Blending a confessional tone with gutsy observations about redefining beauty, the chapters address key issues for women of all ages, including Fighting Fat Talk, Family and Friends, Food, Fitness, Faith, and Going Forward. In the scrapbook tradition of PostSecret and Davy Rothbart's Found, Operation Beautiful is filled with black-and-white photos and a two-color design, making it the perfect gift for any friend, sister, daughter, or niece. CAITLIN BOYLE is the editor of operationbeautiful.com and writes a daily food and fitness blog, Healthy Tipping Point, which garner more than 520,000 hits per month combined. For five years, she served as a contributing columnist for The Wall Street Journal Classroom Edition. She lives in Orlando, Florida. 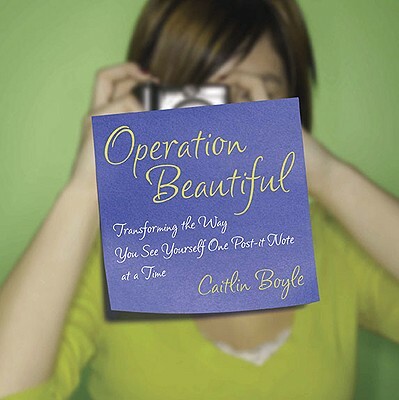 "Operation Beautiful is an amazing book and movement that greatly helps women take control and start slicing out self-hate, stitching up self-esteem, and finally start healing from all the body drama that's making us sick!" "In a time when so many people have their self-esteem and inner sense of wellness determined by plastic and often unrealistic standards, Operation Beautiful guides the way to loving oneself in a wholesome sense and to being the healthiest, best you can be!" "Operation Beautiful is tea and sympathy, a kick in the pants, and a pep talk from a trusted friend all in one. Caitlin walks the walk and expertly weaves her own deep-held secrets in with life-changing stories of women from all around the world...should be mandatory reading for women everywhere."